Is this Sherry truly perfection in a bottle? In my own personal view, it was perfection, though I'll qualify that declaration by stating the sense of perfection came through due to a variety of factors, from the friends who shared that bottle with me to the lengthy history of this bottle. However, on its own, without all of those other factors, this Sherry is exceptional, maybe the best Sherry I've ever consumed. It very likely may be the best wine I drink this year. I can't recommend it highly enough and I hope to acquire more of it one day. If you ever find this Sherry on a wine store shelf, don't hesitate: BUY IT! Before getting into the history of this Sherry, I should give a brief explanation of the Solera system, a process of fractional blending that is essential to the production of Sherry. A solera consists of a number of different tiers of barrels, known as criaderas. The oldest tier is commonly located on the floor of the bodega and progressively younger tiers are placed above this oldest tier. At various times during a year, Sherry will be extracted for bottling from the oldest tier, commonly 10%-15% of the barrel though it may be as much as 35%. Then, Sherry from the next oldest tier will be added to refill the oldest tier, and this process is then repeated for each tier as it is used to refill another tier. As such, the oldest tier eventually becomes a blend of Sherries of many different ages. Now, onto the fascinating history of this very old Sherry. 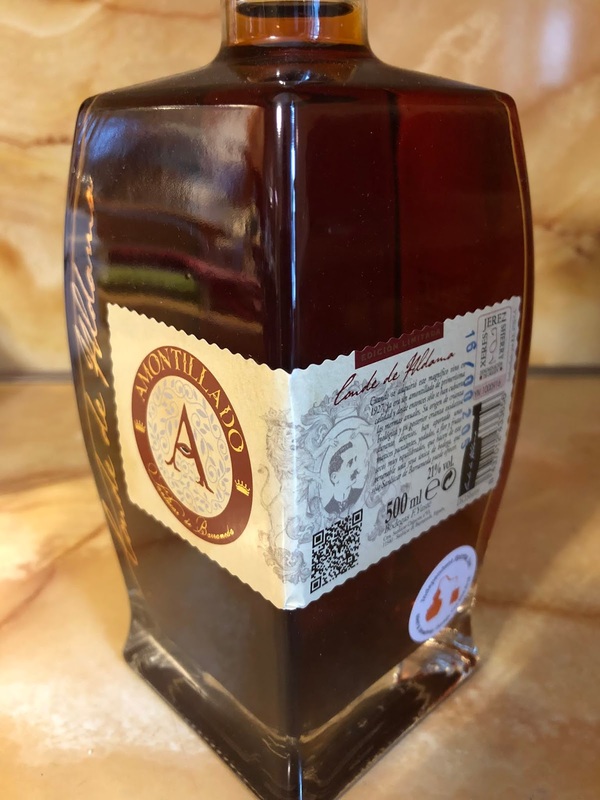 The origin of the Bodegas Yuste Conde de Aldama Amontillado Sherry extends back to the early 18th century, when the solera system first started to be used by the Sherry industry. The bodegas of Aguilar y Cia were established in 1740 in Sanlúcar, and the solera that would eventually result in the Yuste Amontillado was founded sometime between 1740-1750. Just take a moment to consider its age, before even the U.S. acquired its independence, and maybe during King George's War. We then consider the family of León Aldama y Respaldiza, which came to Sanlúcar from the province of Álava, part of the Basque region. In 1823, León took possession of the bodegas of Aguilar y Cia, acquiring their old barrels of Sherry. His family became quite famed in Sanlúcar, especially for their vast vineyards and fine wines. When León died in 1863, his two nephews, Pedro Aldama Gaviña and José Gabriel Aldama Camba, became his primary heirs. Eventually, José became the first Conde de Aldama ("Count of Aldama") and seems to have taken primary control of the family's wine holdings and production. During the 1880s, the dreaded phylloxera came to the Jerez region, destroying numerous vineyards and causing a number of bodegas to close. José lost some of his valuable vineyards and though American rootstock was used to save Spanish vines, José found fault with these new vines. He didn't care for the wine made from the new grapes and refused to add the wine to nearly all of his soleras, except for a few test cases. He basically stopped producing any further wine, and only purchased pre-phylloxera wine to add to his established soleras. Around 1888, José finally decided to seal at least some of this oldest soleras, such as those acquired from Aguilar y Cia, behind plaster, allegedly to protect their value and prevent them from being adulterated with wine from new grafted vines. When José passed away, his nephew, Antonio Aldama Mendivil, the Marqués de Ayala, acquired the estate. Antonio took well to the Sherry business, acting as an almacenista for a number of other companies, and he also invested in other business, from mining to banking. The old soleras, hidden behind the plaster, remained untouched. Eventually, around 1921, there were significant changes and Antonio's financial situation came down crashing as he had started paying insufficient attention to his businesses, being distracted by other matters such as his philanthropy. Due to his bankruptcy, Antonio was forced to sell off most of his businesses and investments. It then appears that in 1927, the old solera from Aguilar y Cia that had been hidden behind plaster was finally unearthed and then sold to Manuel Argueso Hortal, a wine company that no longer exists. Even under that new ownership, the solera remained essentially untouched, eventually being sold to Valdespino and then later being acquired, with a winery, by a property developer. Bodegas Yuste was founded by Francisco "Paso" Yuste Brioso, and in 1991, he purchased the historic Bodega Santa Ana in Sanlúcar, and then in 1998, he bought the Viña La Alamedilla, 46 hectares of vineyards in the Jerez pago Carrascal. Around 2001, the property developer who acquired the old solera and winery from Valdespino sold it all to Bodegas Yuste, which took the materials to reconstruct the Bodega Los Ángeles, located in Sanlúcar. This became the home for the ancient solera begun so long ago by Aguilar y Cia. To this point, the only wine that entered the solera was a small amount to compensate for natural evaporation. Bodegas Yuste later chose to bottle two Sherries from this solera, an Amontillado and, due to some barrel variation, a Palo Cortado. The average age of these Sherries is estimated at 130-150 years old. Have you ever tasted a wine that old? And how much would you expect to pay for such an old wine? 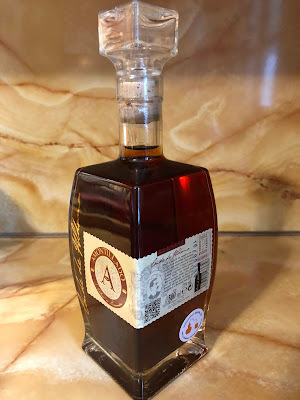 Last fall, while visiting Chicago with my friend Adam, we stopped at a wine store and I noticed the Bodegas Yuste Conde de Aldama Amontillado Sherry (500ml/$210) on a shelf. As a passionate lover of Sherry, it was difficult to resist the siren call of this unique Sherry. I've previously enjoyed some old Sherries but nothing this old. I also loved the nature of the bottle, almost like a decanter (and I've kept it now that the Sherry is gone). I bought the Sherry and then fervently hoped it would make the flight home safely, which it fortunately did. To me, the price was extremely reasonable considering the age and uniqueness of this Sherry. Sherry is too often under-appreciated so it can be an excellent value. You would be hard pressed to find another type of wine, of a similar age, at this price point. I also felt that this might be my only opportunity to purchase this Sherry, considering it is a very low production wine. The next important question I needed to consider was when to open the bottle. Obviously, this was a special wine, and should probably be opened for a celebratory occasion. I finally decided that I would open it for my birthday this year, a kind of a milestone event. Though I could have easily stored it away for several years, I wanted to experience this Sherry, to drink and enjoy it. I didn't want to wait too long. I couldn't deny the siren within this bottle beckoning to me. And as I've said many times before, wine is meant to be shared, and tastes better when consumed with family and friends. Thus, I needed to make the hard decision of who to share this Sherry with, especially considering it was only 500ml, about 17 ounces. It was extremely difficult to narrow down my list of wine-loving friends to a mere handful, and I hope that I can share another bottle one day with others of my friends. Now, how can I describe this unique Sherry when words are truly inadequate to depict its totality? First, it is easiest to begin with the Sherry's color, a rich mahogany. Then, after pulling out the cork stopper, it becomes more difficult to describe the nose, a rich and complex melange of harmonious aromas that seduced and tantalized me. Such an intensity and it was easy to sit there and continue to sniff the glass for a time, seeking everything within the aromas. You could identify some of the aromas, such as almonds, citrus, and tobacco, but then there were wisps of more exotic spices and aromas, which sometimes were tougher to identify, but pleasant nonetheless. And the taste. Wow! Wow! Once again, there was complexity and harmony, a diverse melange of flavors, both familiar and not. So much concentration and bright intensity, yet still remaining elegant and subtle in certain aspects. There was the brine of the ocean, almonds and walnuts, caramel and vanilla, citrus and dried fruit. There were also hints of more exotic spices as well as a touch of earthiness. Each sip brought something new to my palate, exciting me with each taste. The finish lingered on and on, almost endlessly, with sharp acidity and more enticing flavors. I never wanted to stop drinking this Sherry and have never tasted a Sherry as good as this one. Considering its extreme age, high quality and exquisite taste, I highly recommend this Sherry and consider it an excellent value, even at its price point. This Sherry truly made my birthday a most memorable occasion.